Our revolutionary plain black tablecloths combine specially designed fibres with a unique soft touch finishing for a luxurious "cotton-soft" feel. Featuring a number of market leading features including unsurpassed colour retention, superb stain release & minimal shrinkage. There is a science to table linen. Our revolutionary plain black tablecloths combine specially designed fibres with a unique soft touch finishing for a luxurious "cotton-soft" feel. Our unique tablecloths offers unsurpassed colour retention, superb stain release, minimal shrinkage, excellent resistance to snags and outstanding absorbency. It`ll take more than a spilled glass of wine to spoil the occasion. These restaurant quality tablecloths are available in 26 colours including red, black, green and white and various sizes of napkins, square tablecloths, rectangular tablecloths, large circular banquet tablecloths, table runners and placemats. For Alternative styles visit our tablecloths section or go back to our table linen section for further ideas. 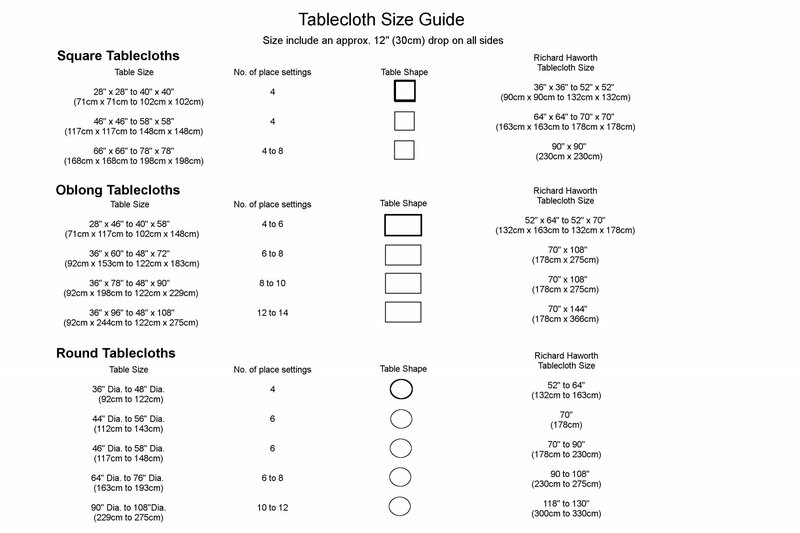 Click here for our table cloth size guide. very impressed with the table cloths Our Response Much appreciated Andrew! Was familiar with the product from a work environment and knew it would meet my expectations. Excellent quality and well made. Washes exceptionally well. I know it will look good every time I use it. Good quality and a few extra helpful hints in their communication. The table cloths are true to size and good quality. Lovely product looks very good on my 8ft table can't wait to use.